There were a few bugs that got introduced in 4.0.4, so here’s an update that fixes them. Chiefly among these bugs are a break in how the Magic Wand tool works, a crash when using Effects, and one when trying to use the Shapes tool. Fixed: Subtraction mode in the Magic Wand tool was generating B-A instead of A-B. Fixed: Crash when using Effect –> Repeat. Fixed: Crash (AccessViolationException) on some systems when initializing the canvas for hardware accelerated rendering. It will still crash but then switch to software rendering for the next startup, which will then avoid the crashing. Fixed: Crash when clicking on the Shapes tool if you had run an old 4.0 beta/alpha and had also changed which shape is used at startup to be a line or curve. Fixed: Crash when using Settings –> Update –> Check Now due to incorrectly determining that UAC is not enabled. The program draws distances and rulers depending on DPI. This works for printing (I assume) but not for correct on-screen reproduction of distances. Is there a switch somewhere or another way for me to set it so that the program will always try to reproduce correct rulers for my *screen*? 1. 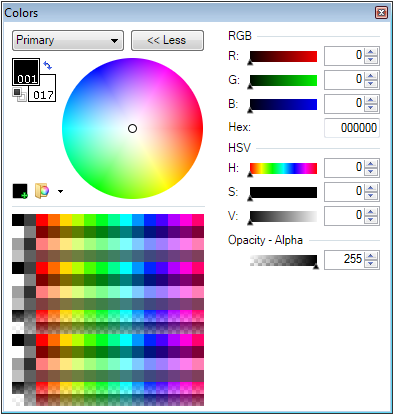 How about increasing the number of color wells of the palette to 256 and showing the number of the color in the palette if the selected color(s) are in the palette? Example: http://i.imgur.com/Sb2AzcQ.png . Is there any way to change the arch size of the rounded rectangle? Fisher, There is 2 things you could do, freehand it or use your brain and use a oval tool instead of the square tool. It was really weird. I couldn’t find the last update. I should post this at the forum but I think here will be better(plus I just got my account locked for typing wrong password…). I want to mention that the Traditional Chinese translation have been modified after the release of the stable version but so far I haven’t seen them. Can you check? Any chance of fixing P.N so it “remembers” where we open dialog boxes, rather than having it always open them right in the middle of our images so we must drag them off to the side to see how effects are being applied? What a time-saver that’d be. Gimp doesn’t work anymore and Photoshop is to costly, so THIS is the alternative. I have a Wacom-Tablet with an eraser on the stylus. This one must be recognized as *another* click device. Thanks for this great program, anyways. ¿Porqué no tienen una página en español? Thanks alot for updating it, I wasn’t using the previous version of paint.net because of crashing issues, installed 4.0.5 and not faced any crashes yet. Oh, and someone suggested using the radial gradient, but it blocks the underlying layer so you can’t use it as a guide, and I want an outline not a filled circle….. oh well. Thanks for the update! I love this image editor. However, I have not figured out how to use the cut and crop function yet. I need to search and find out how to use it as the crop icon is not clickable for the old version. Poo! I just got a new laptop and I can’t download my favorite image editor! how do i crop photo; under image tabe, “crop to selection” is not working. is there another avenue? also, reversing colors, how can you adjust the intensity of the negative effect? You should add support for xBRZ upscaling. You should add support for xBRZ upscaling and also support for Seam Carving.